Oh, no! You walk down the darkened stairway to the archives. About two inches of water sit at the bottom of the staircase and the level rises slowly as more water flows out under the door. What do you do? Should you open the door, turn on the lights, and rush in to save the patriarchy-crushing SisterSerpents stickers? Let out a blood curdling cry for help? Fetch your water wings? Send up the bat-signal? Run? Or should you consult your handy Disaster Preparedness Plan? Floods RAVAGE Cities, Fires DESTROY Buildings, Zombies ATTACK, and Sinkholes SWALLOW museums. While that may sound a little dramatic, the tiniest roof leak or mold outbreak has the potential to cause a great deal of damage to collections. Last semester Nancy, the WLA Director and my supervisor, who is also on the Loyola Libraries Disaster Preparedness Committee, asked if any of the graduate assistants would be interested in helping the committee. When I expressed perhaps too much enthusiasm at the mention of disasters, I was given the task of helping draft an updated disaster plan for the Lewis Library. Since then my life has been devoted to constant vigilance. I’m not exactly sure why I find disasters so fascinating. The first time I really remember thinking about disasters was in an undergraduate class called Geocinema where we watched natural disaster movies, such as Magma: Volcanic Disaster and Tidal Wave: No Escape, critiqued the science, and wrote our own geologically-sound screenplays. As I watched bad movie after terrible movie, I remember wondering why these characters were so dumb. Most of them were scientists – how could they be so illogical? Why didn’t they just make a plan and stick to it? Probably because it is surprisingly difficult to create a plan, keep it updated for when disaster strikes, and execute it flawlessly. Unlike Corbin Bernsen playing a former weapons specialist in Title Wave: No Escape, who has no plan, but ends up teaming up with lady scientist Julianne Phillips to save coastal towns from a barrage of brutal tidal waves, I do have a plan. But I understand why Corbin and Julianne don’t; the Lewis Library Disaster Plan was challenging to write and will be even harder to keep updated. After wading through heaps of information on disaster recovery, I found that keeping these three points in mind made the Disaster Plan easier to write. 1. Find a focus. Although the Disaster Preparedness Plan puts human safety before collections, it focuses on the aftermath of the disaster, not the eye of the storm like Corbin and Julianne are forced to deal with. Although emergency instructions are a part of the plan, it was difficult to balance the inclusion of vital instructions for human safety and the assessment and salvage of damaged materials. Although the content is different, “Minor Zombie Emergency” and “Major Zombie Apocalypse” have the same layout, making it easy to identify important information. 2. Organization is vital. Even when all of the important information is present, it won’t do you any good if you can’t quickly find what’s relevant to you. 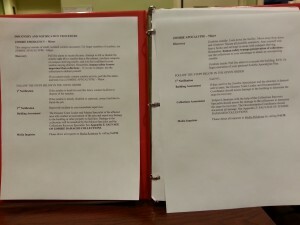 I looked at disaster plans compiled by other archives, libraries, and museums to find a simple, user-friendly layout. By using the same layout for each disaster situation you can easily tell that wet books should be dried or frozen within 48 hours to prevent mold growth, whereas microfilm and motion picture film need to be rewashed and dried within 48 hours. 3. Keep it relevant, useful, and updated. Phone numbers change, businesses go belly up, knowledgeable staff retires, collections move. The last complete Loyola University Libraries disaster plan is from 2007; it acknowledged that the plan needed to be updated yearly, but daily work often takes precedent over long-term planning. A disaster plan should be a living document, changing with the institution, but how do you accomplish that? I’m not sure. I can write that the Disaster Preparedness Committee will update the plan yearly, but that won’t make it happen. Maybe a monthly email to the committee with the “constant vigilance” gif would help. If Corbin Bernsen and Julianne Phillips kept these points in mind, maybe they could create a plan for the next time tidal waves start destroying the coast.